My good friend Trevor and myself (Cole) love whiskey. And we’re not talking about your average liquor store whiskey. So much so, that about a year ago, we started to compile a list of all the whiskeys we have ever tried. The more we added to the list, the harder it was to find new whiskeys. So we started traveling all over our state for wider options and more selection. Eagle Rare comes in two ages. The standard is Eagle Rare 10. And this is honestly the best bourbon bottle you can get for about $30. (Trevor and I will soon, if not done already, put up a in depth review of Eagle Rare 10, just to explain how great it can be, especially for the price). The second age is their Eagle Rare 17 Year. So far as we’ve seen, this bottle is not found anywhere online for less than $350. The fact that we found a glass of Eagle Rare 17 at this local steakhouse bar for $25 is amazing. This price has been referred to as “stupid cheap” by a trusted whiskey bartender confidant in town. And that is verified by every other place I’ve seen who sells it (if at all) at a minimum of $45 a glass. This is the greatest whiskey we’ve ever had. 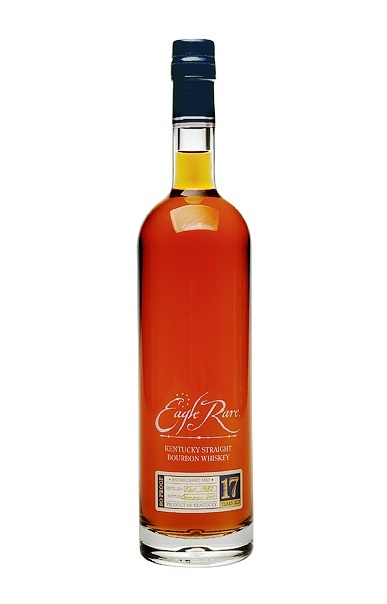 So the dream began: To get our hands on a bottle of this Eagle Rare 17 as soon as possible. And certainly, bottles like this fit in the latter group. So theoretically, the only way we’re really going to achieve our dream is to develop a great friendship and customer relationship with a (well-established-in-whiskeys) liquor store owner/stocker and, in essence, “know a guy”. But that takes a steady purchase string and solid rapport with said person, and that takes a lot of money. This is very hard to find. I would go as far as saying these are less than 1% of all liquor stores. The fact is, that only 3 stores in state last year were given any bottle of Eagle Rare 17. We had found one of those three stores in our city. Here’s why: Like I said, we each make enough to support half of this “rapport/purchasing” plan. But instead of thinking to benefit oneself, think of combining our presence into one. No longer are we looked at as two half wallet nobody’s, but we are looked at as one full paying presence that was consistent. Game theory 101! And every time we went, we would say hi and discuss our purchases with the guy that stocks their whiskey. This way, we become known to be a consistent and high paying presence there. After we are recognized by face and name, we will slow down the frequency but keep consistent to a week and a half basis and high priced bottles. Basically get up high on the texting list for when they make rare purchases and distribute to their favorite customers. The point is to not just get the “back room” whiskeys, but get the whiskeys that never really make it to the back room at all before they’re picked up. We thought as we were meeting our goal, we would document the progress but also review each whiskey we pick up.